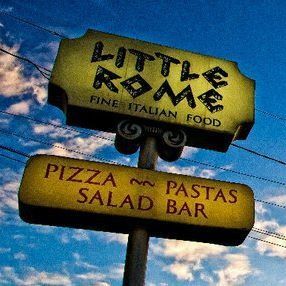 Little Rome serves "Fine Italian Food" to the entire North Georgia area. Customers have been traveling to our scenic location in Chatsworth, GA near the foothills of the Blue Ridge Mountains since 1979. Oven baked pizza, pasta, and sandwiches are our specialties and our spring fresh salad bar has been said to be the best in the area. Backpacker Magazine voted our Blue Cheese Dressing the best this side of the Mississippi and wrote that Little Rome was a "must stop" when exploring North Ga's mountains.